ot be difficult because you have a variety to choose from and they come in different designs that are appealing to the eye. We all know that no one wants to enter through a door which is inconvenient to open. This needs to be avoided by all means and you need to buy a door handle that is strong and that will not break easily. The quality of the door handle should be a key factor and you need to focus mainly on that. The purpose of the door handle is to make it easier to come in and out of the room without having to struggle or push the door. Saving money is important but you need to buy a door handle that has a long lifespan and of good quality. Before choosing a door handle you should decide the price class of the handle. 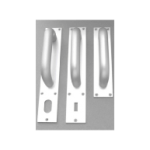 Once you have set a budget for the purchase of the door handles then you can make a decision on the type of door handle that you want and that is within your budget. When selecting a door handle you need to look at the door type. Doors can be classified as follows which is interior, exterior, gate, sliding and sauna door. You need to know which door handle is more suitable for your door and if whether it will look attractive. Simple handles can be installed in interiors doors and they are not used intensely. Handles that are made of aluminium and of zinc alloy can be used with interior doors. These handles are much affordable and they are available range is wide. This means that they are easy to find and they are better choice when you do not have enough money for a door handle. KR Landro has unique and affordable door handles that come in different designs and that can fit on any door type.